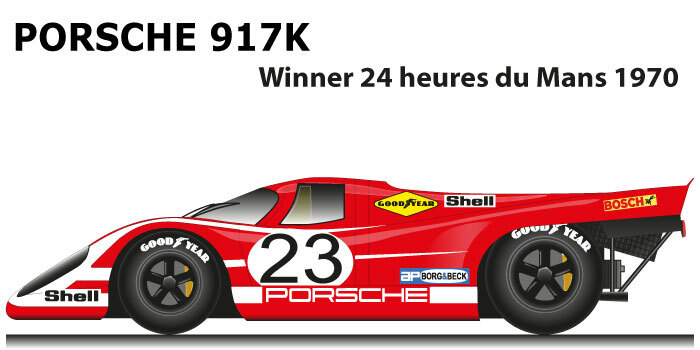 The Porsche 917 K n.23 is the winning car of the 24 Hours of Le Mans of 1970. The German manufacturer decided to win his first 24 hours of Le Mans, follow the suggestion of Team John Wyer Automotive Engineering, solving the problem of instability affecting the 917, the rear was shortened and raised creating a sort of arrow profile that also improved the cooling of the rear mechanics. Hermann and Attwood won the 24 Hours of Le Mans in 1970 with the Porsche 917 K n.23, the car of the Porsche Team KG Salzburg came in front of the Porsche of the Martini Racing Team, according to the Porsche 917 L n.3 of Larousse and Kauhsen with a five laps, while the third 908 n.27 of Lins and Marko eight laps distant. Hermann had promised his wife that when he won Le Mans he would retire from the car races, in fact after the race he announced his retirement.